We have been in the magazine and paper business for over 30 years. We have over 250,000 magazines in stock with many different titles, an also we have approximately 200,000 Ads from old magazine. We are currently sorting, grading, and pricing them to be listed, so please check our site often as this will take some time. Here are just a few titles of magazines that are currently working on; Look, Colliers, and Saturday Evening Post and many others. We also have a large stock of ads that we need to sort and categorizes before we can list them. 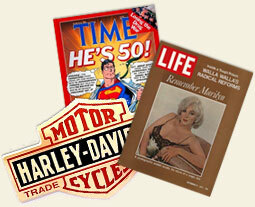 People buy old magazines for birthdays, anniversaries and other special events. They are wonderful warm memories from days gone by. People enjoy seeing the old ads from the past it is great to look back and see the cost of things then and now. other family, friends, and associates. Many old magazines have great old color and black and white ads suitable for framing.